McClain’s Cody Pollock slides into third base on Saturday at Mitchell’s Park in Greenfield where the Tigers hosted the Fairfield Lions in a cross-county rivalry baseball game. Nathan Vidourek attempts to catch the ball and guard the bag for the Lions. 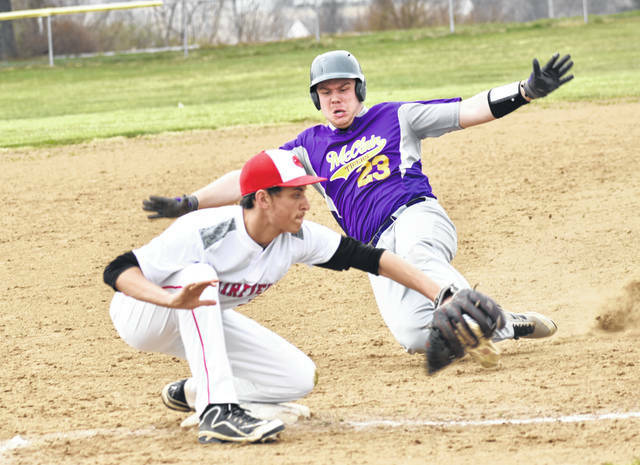 The McClain Tigers varsity baseball team hosted the Fairfield Lions in a cross-county rivalry game that saw both offenses perform well on Saturday at Mitchell’s Park in Greenfield and the Tigers earned an 11-7 non-conference win. The Lions struck first in the top of the second inning when Ethan Grooms and Griffin Irvin each tallied a run and gave the Lions an early 2-0 lead. McClain responded with five runs in the bottom of the second inning to take a 5-2 lead. A single by Colton Mossbarger scored Evan Hutchinson and Wyatt VanDyke. John Salyers followed up with a fly ball that resulted in an error by the Lions and allowed Eric Anderson and Colton Mossbarger to score. Fairfield scored two in the top of the third inning when Irvin drove in Jacob Morgan and Sam Buddelmeyer to make it 5-4 and tied the game in the top of the fourth inning when Buddelmeyer drove in Austin Setty. The Tigers were able to take the lead for good with four runs in the bottom of the fourth inning as Austin Booth doubled on the first pitch of the at bat to score Salyers after Mossbarger scored on a passed ball and Garrison Banks singled on a 1-2 count, scoring two runs and bring the score to 9-5. Preston Anderson earned the victory on the mound for McClain and pitched four innings, allowed five runs on six hits and struck out three. Nate Terrell threw three innings in relief and recorded the last nine outs to earn the save for the Tigers. The Tigers traveled to Chillicothe on Monday and took on the Chillicothe Cavaliers in a Frontier Athletic Conference baseball matchup that saw the Tigers pick up their third consecutive league win by a score of 3-2 and start the FAC part of their schedule 3-0. The Tigers scored two runs in the top of the seventh inning, the first when Mossbarger bunted into a fielder’s choice that scored Hutchinson and Salyers hit a sacrifice fly ball that plated Nate Terrell and made the difference in the game. Mason Ratcliff picked up the win for the Tigers and pitched a complete game on the mound including a one, two, three seventh inning that saw the defense, including Ratcliff, make the plays necessary to end the game.